The Lady Redskin Varsity Tennis Team finishes 4th Place at the Great Bend Tennis Invitational led by senior Susan Nguyen dominating the #1 Singles spot. Junior Kathy Nguyen, #2 Singles, battled tough opponents all day gaining valuable experience, and the two doubles teams continued to show improvement. Participating teams included Dodge City, Ellinwood, Garden City, Great Bend, and Wakeeney. Ellinwood finished 1st Place as a team with 40 points followed by Dodge City with 35 points. #1 Singles ? ?Susan Nguyen went 5-0 on the day earning the 1st Place gold medal. With her talent finally shining through, Susan dominated opponents with crisp shots at angles, running her opponents from side to side setting up a winning shot to end most points. She defeated Dodge City ? ?s Hannah Thomas 8-2, defeated Great Bend ? ?s Brooke Tiemeyer 8-0, defeated Garden City ? ?s Amber Gardner 8-0, defeated Ellinwood ? ?s Gentry McLeland 8-1, then defeated Wakeeney ? ?s Jackie Albin 8-2 to earn the 1st Place gold medal. #2 Singles ? 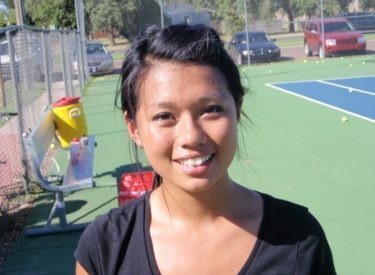 ?Kathy Nguyen went 2-3 on the day but battled talented opponents to the end. She learned to be patient, setting up her opportunities with consistent ground strokes. Kathy is close to achieving the strategies to reach the next level of talent. She lost to Dodge City ? ?s Kelly Brauer 1-8, defeated a very talented opponent from Great Bend, Sophia McVay 8-6, lost to Garden City ? ?s Julie Damien 2-8, lost to Ellinwood ? ?s Kaitlyn Rosl 6-8, then bounced back to defeat Wakeeney ? ?s Emily Wyse 8-4. #1 Doubles ? ?Katie Plunk & Lauren Harp went 0-5 on the day. Lauren played her first varsity tournament at the #1 Doubles spot but showed she belonged with good technique and competitive spirit. Katie worked the net while sister, Maddie, cheered from the stands. #2 Doubles ? ?Jacqueline Nguyen & Kassandra Rosales went 0-5 on the day. Kassandra ? ?s new racquet seemed to be working as her serves looked great, and Jacky ? ?s aggressiveness paid off with slams at the net. We are still trying to find a winning combination at the doubles spots, but the girls are working hard and showing improvement. The Lady Redskins travel to Dodge City this Thursday.